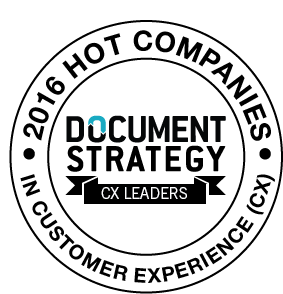 Eclipse Corporation is pleased to be named a “2016 Hot Company in Customer Experience (CX)” by Document Strategy Magazine. Document Strategy Magazine is a world-recognized publication dedicated to the advancement of communications, document generation, enterprise content management, and information management strategies to help enterprise companies deliver superior customer experiences as well as business successes. Covering topics such as customer communication management, customer management, and customer experience, Document Strategy Magazine recognizes the importance of customer-facing documents and customer interactions to business success. This year’s “Hot Companies” list features firms with a proven track record of success in helping businesses to achieve revenue growth through the promotion of superior customer experiences. With customers like AT&T, GE Healthcare, Pella Corporation, and McKesson Medical Surgical, it is no surprise Eclipse makes headlines while shaking up the document generation and customer communications industry. Eclipse is proud to be named a “2016 Hot Company” as it continues its journey toward making the world a better place – one document at a time. For more information on the Future of Document Design and Generation, visit our contact page or call 678-408-1245.